Training is one of the fundamentals of pet care. Affection and exercise are essential elements to raising a happy and healthy pet, but pawrents shouldn’t overlook their fur babies’ discipline. Pet training can help curb your pet’s bad behavior and ensure their safety. It represents a huge part of your interaction with your pup or kitty and a great opportunity for you to bond. Also, a well-behaved pup or kitty is simply a joy to be around. But training can be challenging and time-consuming. Luckily these days technology exists to make this activity a little bit easier. Here are some tech tools that can help. This smart treat camera with a built-in treat dispenser will help you stay connected to your pets while you are away. It contains a wide-angle 1080p HD camera, a microphone, speaker and night vision. You can watch, chat, and interact with your pet remotely, all through your phone. Apart from monitoring and entertainment, Petcube Bites pet camera allows you to prevent bad behaviour from your pet and reward them for their good habits. Whether your cat broke a vase or your pup is barking, you will get a notification triggered by the built-in motion and sound sensor. You can go online immediately to stop or calm your pet and fling a treat. This clever feeder is activated to open by your pet’s microchip. It’s designed to alleviate the problems of food theft in multi-pet households, preventing overeating or ensuring that a prescription diet is consumed by the correct pet. The lid will only open for the right chip and it’s programmed by one simple button. Keep in mind that it might take a few days for your pet to get used to it, so persist. You are sitting in your office missing your beloved pet. PetChaz HD is here to help with two-way communication and “silent mode” monitoring of your pup or kitty and making sure they are behaving. It does not matter where in the world you are, your pet will see your face on the full-color LED display. The gadget attaches securely to your wall with no sharp corners, edges or cords to chew. Click the Treat Button when your dog or cat deserves a reward. After a few minutes of training, your pet will love it. It works best if your cat or dog is motivated by treats but you can use it just as a camera as well. Pet ReMote is a wearable mobile training device that allows you to train your pet from your smartphone. The gizmo attaches to your pet’s collar and you are able to control the device from a smartphone app. This is a no-shock collar, so no need to worry about hurting your pooch. You can choose whether to use vibration and/or acoustic signals to tell your pet whether it’s doing something right or wrong. Your dog learns the signal and reacts to it. The default setting offers the commands “sit”, “down” and “come” but you can program in your own. Obesity can affect all types of pets and impair their quality of life. In fact, fat cats and dogs are expected to outstrip healthy ones within five years. Petnet trains owners instead of pets. It trains them to feed their pets properly. The SmartFeeder measures portions based on your cat’s or dog’s age, weight, and level of activity, so you can put an end to overfeeding. It also lets you set automatic feeding times and programs to make your life easier. But the gadget goes further. It also helps ensure your pet is eating nutritionally ideal food. It will even monitor how much food supply you have left, and deliver more right to your doorstep when it detects you are running low. Similar to PetCube Bites, this is a treat tossing, full HD, WiFi Pet camera and 2-way audio. Just fill the thing with over 100 of your pooches favourite treats and play a game of catch. The camera also has night vision so you can livestream wide-angle view video both day and night. 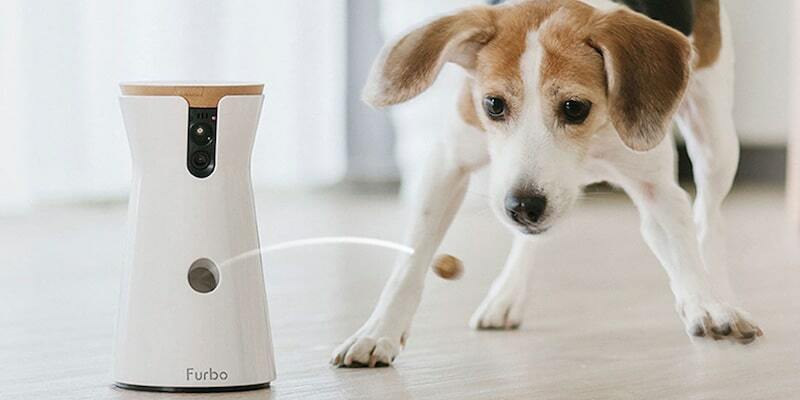 To make complaints from neighbours a thing of the past, Furbo can detect your dog barking. It even has clever algorithms which are able to alert you when it detects dog movements like jumping on furniture or chewing on cords. It will also let you know when your pooch might be in danger. Rachel is a professional cat lady who has turned her love of pets into a job and loves to talk about sassy cat style. Writes for Petcube.